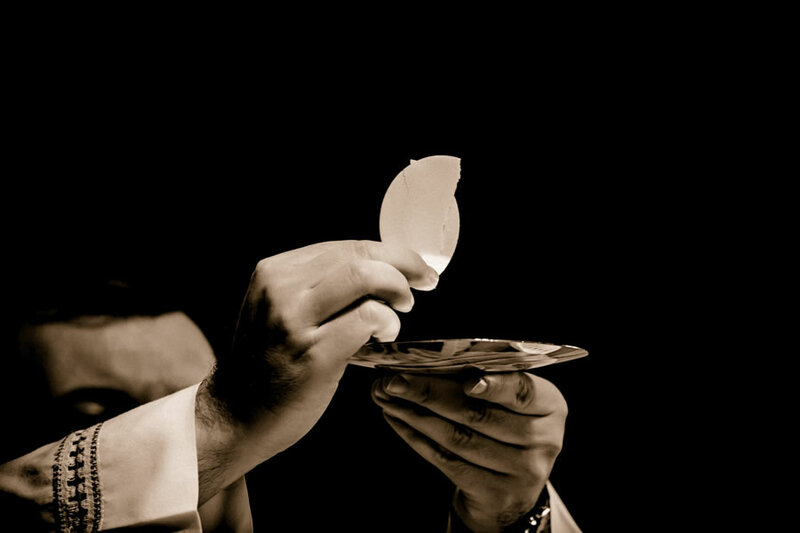 Before we dive into the individual Eucharistic Prayers, I want to look at the middle portion that all of them have in common, the institution narrative, the consecration when the bread and wine truly become the body, blood, soul, and divinity of Jesus Christ. The moment of Consecration is the moment the most important and solemn, the most sublime and touching, the most holy and fruitful of the whole sacrificial celebration; for it includes that glorious and unfathomably profound work, namely, the accomplishment of the Eucharistic Sacrifice, in which all the marvels of God’s love are concentrated as in a focus of heat and light. This is the main embolism* in each of the Eucharistic Prayers, and it is the central point of the prayer, both in theology and in structure. Remember my comment early on that receiving communion is not the most important part of the Mass? That is because this moment followed by the offering of the sacrifice to the Father is the high point. The priest, by speaking the words of Christ at the Last Supper, brings about the miracle by which God feeds our souls and continually gives us new life. It is important to note that the specific words must be said by the priest as written in the Missal, but these are a liturgical rather than a scriptural text. You won’t find the specific text in any of the institution narratives in the Gospels or in Paul. Rather, the liturgical text is created by a sort of amalgamation of the four in Scripture. After the bread and the wine are consecrated, they are raised so that people can adore. Traditionally, bells are rung at this moment. This use of bells originated for a very practical reason. We are called to worship at this moment, but it would be basest idolatry to worship bread and wine. So, the bells were introduced to inform the faithful that it is now safe to worship because the bread and wine are no longer merely bread and wine, but the body, blood, soul, and divinity of Jesus Christ. If we are using incense, we also incense the host and chalice at this time. As a side note, you will notice that Jesus Christ, himself, in the form of the Blessed Sacrament is the only recipient of incensation while kneeling. In the post-Conciliar reform of the Liturgy, the celebrant says, “The Mystery of Faith,” to which the congregation responds with one of three formulas for the Memorial Acclamation. In the pre-Conciliar Liturgy, the phrase that has become understood as the introduction to the Memorial Acclamation was inserted in the consecratory prayer for the chalice, but its origin and the precise explanation for this placement remains unknown. An unfortunate translation in the pre-2011 English rendering of the Mass introduced a bit of confusion. The Mystery of Faith is not the acclamation that the people make; rather, it is in front of us on the altar at that moment. The mystery of faith is the fact that bread and wine have been transubstantiated into Jesus Christ for the sake of our salvation. The people then respond to that fact speaking directly to Jesus Christ who is now present on the altar. You will notice that the priest does not participate in that response. This is a response proper to the congregation gathered in response to the prayers the priest is saying on their behalf. After the Memorial Acclamation, the Eucharistic Prayer continues.